Jemaa El Fnaa, Moroccan Mosaics, Saadian Tomb, Majorelle Cactus Garden, Koutoubia Mosque, Kasbah Mosque, Moorish Architecture, Snake Charmers, Mahgreb Tea, Tagine. How: Flights, Grand Taxi, Camel trekking, Walking. Illnesses or mishaps: Surviving a ride in the Moroccan death taxi with its steaming engine, broken doors and distinct lack of seat belts; having a very close shave with a local thug in Ouzoud. This was my first taste of the African continent - and it proved to be very testing and utterly different from my expectations and prior travelling experiences. The Kingdom of Morocco, to give it its full title, rests on the northern edge of Africa and is made up of large chunks of mountains and desert. It borders the much-troubled Algeria to the east and Mauritania to the south. Morocco does not have a great reputation abroad - and this was borne out by anecdotal stories from friends. Only a few years ago a friend of mine had to abandon his hitch from London to Morocco because of an increase in tourist kidnappings. He only made it as far as the tip of southern Spain and had to turn back. It was just not safe. 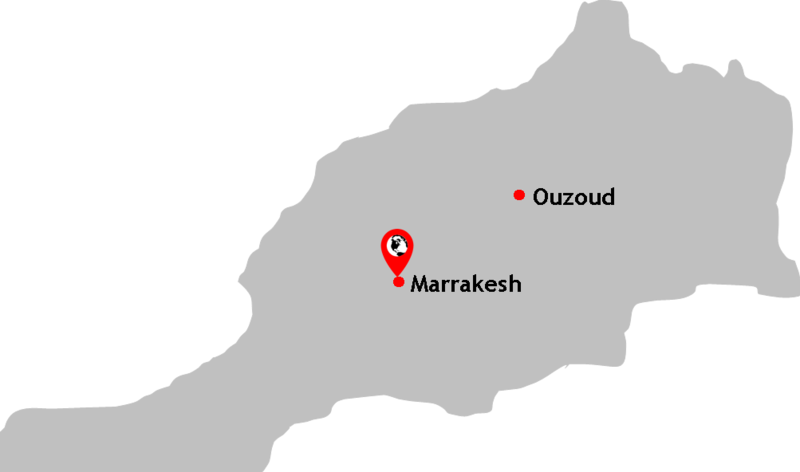 This was to be a week- long adventure in Morocco taking in the cultural heart of Morocco - Marrakesh and a trip out to the physical heart of the country in Ouzoud - home to the famous waterfalls and the area noted as the start of the Atlas Mountain region. Having an attitude definitely helped in Morocco - looking like you're angry and aloof helped keep the predators at bay. Poverty and desperation are evident in many of the faces you will see in this country, making it a very difficult place for you to enjoy your holiday. Expect harassment, expect people to grab your arm and lead you away, expect levels of aggression born out of frustration and poverty. It is a very humbling experience where you will see levels of desperation not seen before: it is a desperation which is tangible in the waiters demanding tips, the jobless men offering to be your 'guide', the overworked and mistreated animals you will see by roadsides. My school level French was an amazing god send - I was able to barter taxi fares, talk to chemists about my sore throat (which was very painful and stopped me speaking for part of the trip), as well as fend off people. Knowing the Arabic for 'no thanks' (Choucran) certainly gave the impression that we were not as green as we actually were - and is the phrase any person travelling to the country needs to learn. Key is developing a dismissive, almost rude persona when dealing with the characters you'll inevitably come across. Beware, however: be too rude and the men, in particular, will use aggression back. This happened to us when we headed out into central Morocco. People will approach you - just make sure you have your response ready and waiting and you stick to your guns. Morocco also has a potential to be lethal to the foreign visitor. A restaurant we frequented on several occasions in the Jemaa El Fnaa called the 'Argana Cafe', which lures tourists because of its central location and view of the square, was partially blown up by a Muslim extremist at the exact spot where we ate. To see the proximity of the bomb photographed on The Guardian website, which almost perfectly matches the positioning of the camera in my own holiday photographs, was a little alarming. It does, however, succinctly capture the type of threat countries residing in unsettled continents pose to tourists. The best Morocco travel advice I can give? Research and prepare. Morocco wasn't all bad. I find any place interesting whether it is geared up for tourism or not. Outside of the slightly overwhelming souks, Morocco didn't seem prepared for foreign visitors at all. Just the ability to saunter around and take in the atmosphere is enough for me. As a result of Morocco I now own a Tagine for cooking Moroccan-style vegetable dishes like the ones I had eaten in Marrakesh. However, a relaxing holiday this was not. A key recommendation is to head out of, and away from, old Marrakesh - its medinas and the Jemaa El Fnaa. Get out into the mountains or even just the nearby countryside. The journey out to the mountains can be a little hair-raising owing to the rudimentary transport options connecting Marrakesh and the High Atlas region (as you will read below), but it is well worth it. The key focus of Moroccan hospitality comes in the form of Mahgreb, or minted tea, served in small glass cups. The preponderance of a colour known as Moroccan pink (more like apricot) covers buildings all around, giving the place a rosy glow. It may be a traveller faux-pas to say you didn't like a place but, to be honest, I didn't really like Morocco. I think part of the problem was me - I just wasn't prepared for it and entered into Marrakesh like a lamb to the slaughter. Had I been a little more knowledgeable and well-informed I may not have had the negative response that I did. Morocco: an adventure, definitely. Enjoyable? Possibly - but only in a morbid fascination kind of way - a place for the seasoned and experienced traveller only, I would argue. Arriving in Marrakesh, and initially impressed by the uber-modern aeroport, our positive impressions soon gave way to the dark chaos of the Jemaa El Fnaa, the main square was teeming with youths on motorbikes, smelt of fires and sewers and had yellowy-lit mosques. A visceral thud of drumming added to the general Wild West feel of the place. Poverty, slums and disablement were everywhere; the new clothes I'd packed for some nice holiday snaps were swiftly sidelined and replaced by the comfortable, by the practical. Within the first few hours of arriving in the Jemaa El Fnaa, I was convinced that the trip would not pass without incident; Morocco is definitely not a place for the novice traveller - you will get eaten alive by the invasive 'guides' and hawkers. Taking photographs of any of the poor little creatures in the main square, including pythons, grass snakes, monkeys and rabbits (all looking dreadfully unhealthy and uncared for, might I add - the RSPCA would have a fit) requires immediate payment to the handlers. Non payment triggers a swarm of locals around you - some of whom grab your arm. The Lonely Planet travel book we had failed to mention any of this, but did go to great lengths to talk of the amazing performers of the Jemaa El Fnaa. It was, actually, a rather brutal and unsavoury place which only felt marginally safer during the day. Trying to locate our Riad (a Moroccan take on the Bed and Breakfast) was utterly impossible in the poorly lit labyrinthine streets - it was evening, pitch black and we were tired. Luckily we had the mobile telephone number of the Riad's owner who came to collect us from outside one of the square's main restaurants. We simply would not have found our way out of the square without him. I have never been so happy to see a stranger in my life. When we realised who it was approaching us (initially thinking it was yet another hawker), we both breathed a massive sigh of relief: we were being safely escorted out of the madness. Here's a tip: parts of Marrakesh old town are very poorly sign posted. Many of the warren-like labyrinthine streets do not have names and, if they do, they are known only to locals. Oh, and don't expect Google maps to help you out here either - the streets are shown but are anonymous blanks. Therefore, if you are going to arrive at night time (check your flight time) make sure you have help to call upon in the form of a phone number or even a pre-arranged airport transfer. That, or book a five-star hotel on the outskirts of the city - but this is hardly the best way to feel Marrakesh proper. We opted to stay in a local Riad located at the end of a winding alleyway off of the main square (call to prayer, anyone?) and accessible through the Souks. We were definitely at the heart of the action but I could have done without the potent smell of sewerage in our room and the mould-covered walls hidden by colourful fabric! The second day proved much better as we'd booked a half-day camel trekking trip in the Palm Groves area twenty kilometres outside of Marrakesh. We spent our day with two Americans, a guide who spoke no English but whose smile made up for it, and a camel called Ali Baba. This leg of the journey showed me a more tender, calmer side to Morocco which I would not otherwise have seen. Our American friends headed back to their five star hotel on the edge of town with cable TV...and we headed back into the Jemaa El Fnaa. I was a little jealous of them but we had made our choice and had to stick with it. Arriving, miraculously, back in Marrakesh safe and sound after our trip out to the High Atlas mountains on days three and four, the next task was to find our second Riad back in Marrakesh. The telephone system was not working and so the only way to get to the Riad was to find our own way there. It was in an area in what I can only describe as something out of 'Slumdog Millionaire'. There were people weaving out of ground floor box rooms, hooded men grouped on corners surveying us suspiciously as, all the time, motorbikes zoomed along and donkey carts lazily pushed past us. It was grim and unnerving. In a last-ditch attempt to get to our Riad, we hired a taxi for the benefit of buying local knowledge. However, the car could only take us so far and came to a grinding halt as the alleyways and streets became too narrow to drive down. The driver then enlisted the help of three local kids who took over the navigation and who then demanded payment for their services. They were paid with a £1 coin - completely useless in Morocco but I think they were pleased to get a coin from a foreign land. With that, the door opened and the Riad's owner beckoned us in. Our final day was spent visiting the Majorelle Cactus Gardens which were a welcome little oasis of calm in a crazy place. Owned by Yves Saint Lauren, the French fashion designer, Majorelle is a botanical garden stuffed full of fascinating cactus varieties set against walls and pergolas of vivid yellow and blue colours. Any real fan of cactuses, like me, would be mad not to visit Majorelle: it's a photographer's dream. Even the worst of photographers can leave this ten acres with photos to be proud of. The Majorelle Gardens were a highlight of our trip to Marrakesh. A minaret peeks between the arches and palms. The cool and satisfying white Moorish designs of the Mohamed Mausoleum located in the vicinity of the Koutoubia Mosque. The Koutoubia Mosque with its distinctive Moorish design. The Kasbah Mosque replicates key traits of Moorish design such as its band of tiles. The hustle and bustle of night-time Marrakesh in the Jemaa El Fnaa. The vivid colours of the local crafts on the stalls, the night lanterns' yellowy pools of light and the blur of evening tourists. We travelled 165km north east to Ouzoud in the Azilal province to see the famous 110 metre, three-tier waterfall. The journey in the 'Grand taxi' out to the mountains went without a hitch. We zoomed through the Moroccan countryside, a scorched rosy red earth topped with luscious greenery. Passing small settlements and curious Arabic markings on hillsides, we arrived in Ouzoud four hours later. We stayed at an absolutely wonderful Riad called Riad Cascades Ouzoud, which was run by a helpful little man who was willing to make us welcoming hot drinks. We seemed to have left the hot weather behind us in Marrakesh, swapping it for a distinct mountain chill. The Riad was virtually empty and so we had the wonderful upstairs lounge area to ourselves in the mornings and the afternoons. It was perfectly quiet and perfectly idyllic. Like many travellers making it out to Ouzoud, the main focus of our stay was the waterfall. Seeing the Barbary apes made a chilly trip down hillsides to see the falls that little bit extra special - they casually scratched and surveyed us suspiciously we made our descent. Cascades D'Ouzoud: 110m, three tier waterfalls in the province of Azilal. Standing precariously at the top of the Cascades D'Ouzoud. Avoid being British and feeling like you have to engage with the hawkers and scouts in the DJemaa El Fna. Be polite but firm and they should leave you alone. If arriving late and, like us, you are staying in one of the local riads in the warren of streets, make sure you know how to find your way there. If not, ensure you have the riad's phone number with local code included. You may be very glad you planned ahead - we certainly were. Without it we would have had to abandon our attempt at finding the riad as Marrakesh is just so poorly signposted and ill-lit. Camel-trekking in the Palm Groves is a nice way to escape the frenetic, energetic (and overwhelming) Djemaa El Fna. For this reason alone it is well-worth building into your itinerary. Not wishing to be alarmist, it helps to be aware of what's around you in Marrakesh - keep your eyes peeled in busy restaurants and places where tourists gather as these types of places have fallen victim to bomb attacks in the recent past.